A 999 call handler who persuaded a dog walker to resuscitate a "lifeless body" has been nominated for an award. Emergency dispatcher Sarah Fisher said the caller told her he had found a "dead body" beside the Severn Estuary in January 2018. Ms Fisher, from Bristol, said Richard Gaman was convinced the man was "dead and beyond any help" but she persuaded the caller to return to him. 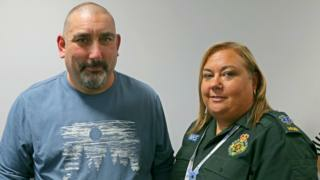 The patient whose heart had stopped has since made a "fantastic recovery". Ms Fisher who works at the SWASFT control hub, near Bristol, said the incident showed people should "never give up" trying to help someone. She said although the situation appeared hopeless, she refused to give up on the patient. "I didn't know why the patient was there, how long he'd been there, or what had happened. "The caller was convinced the young man was dead and beyond any help. But I really wanted to get him to do something for the patient. "It was an amazing outcome." The Control Room Awards were launched in 2018 to celebrate the "unsung heroes" of the emergency services. The winners will be announced at a ceremony in Nottingham on 7 March.